• What really happens upon bodily death? • Why am I really here on earth? • Why has my life turned-out the way that it has? • Is the Bible really the word of God since millions of people are now questioning its validity? • Since I don’t identify as a Christian, will I still be allowed in Heaven? • Who or what is to blame for my child being born with multiple birth defects? • Do married couples and families really stay together for all of eternity? • What really happens when an individual commits suicide? Do they burn in Hell for all of eternity? • Why would a loving God allow my child to die at such a young age? • Why does it seem that God doesn’t answer any or all of my prayers? • Am I really following the “right” or “one true” religion? • Do I really need my body in Heaven after bodily death? • Is it okay if my body is cremated? • Why would a loving God allow so many people to live in virtual poverty and despair while others live lavish lifestyles? • Perhaps you’re fearful of your pending life review when you (as many believe), stand before God to be judged, and you are concerned about spending eternity in hell? If any of these questions or concerns have ever crossed your mind, then this highly-controversial book is for you! 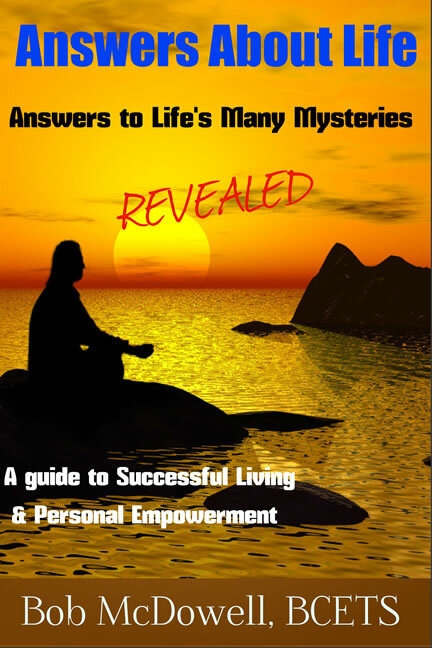 “Answers about Life: Answers to Life’s Many Mysteries Revealed” is without reservation, the most valuable resource in the world when it comes to revealing the spiritual truths and knowledge that we all claim to be seeking, and it provides answers to all of the above-mentioned questions and concerns, plus many more. It also answers the questions you didn’t realize that you had until you discover the answers to them. In 1981, author Bob McDowell survived a full-blown near death “transcendent” experience, meaning that his experience went above and well-beyond that of a typical near death experience, in that he was provided with spiritual knowledge and truths which are not typically obtained by the millions of others who have had a near death experience. This is evidenced by the spiritual lessons which he learned and brought back with him to share with others. If you’ve read other books written by NDE survivors, you’ll quickly realize how the content contained within the pages of this book separates itself from all other NDE books on the market today, as it goes where no other book has gone before. It took him many years to even talk about this experience with his closest friends and over 30 years to initially write about it because it was so shockingly profound, as it went against nearly everything that he had been brought-up to believe was true from his Protestant (Disciples of Christ) religious upbringing. What makes “Answers about Life: Answers to Life’s Many Mysteries Revealed” so credible and separates it from all of the other books in this genre, is that it was written without any hidden agendas or prejudices whatsoever. McDowell is not a minister, pastor, Bishop, Elder, Priest or Rabbi. He is not a psychic medium; he doesn’t talk to dead people and doesn’t profess to have any special powers, or even all of the answers. He has absolutely nothing to promote, other than the need for a more spiritual life. Since his paranormal experience in 1981, he no longer affiliates himself with any earthly religion, and he has no desire whatsoever to promote himself or what he learned by engaging in radio or television interviews, as he’s not interested in fame, fortune, or becoming a household name. He simply sees himself as a messenger-of-sorts, and in numerous instances throughout this book, he actually encourages his readers to form their own opinions based on the facts and (sometimes simple logic) which he presents. This book is about complete honesty and integrity, and it manifests itself throughout the book. “Answers about Life: Answers to Life’s Many Mysteries Revealed” is written in an easy-to-read conversational style and with a respectful tone as well. It stimulates the mind and gives readers a lot of food-for-thought. Readers of this book will walk away with a completely different view of the world, the people around them, and themselves as well. They should also prepare themselves for a journey of spiritual growth, enlightenment and empowerment. To preview and invest in this empowering book in Kindle format as well as other mobile devices, CLICK HERE. To invest in this book in PDF, CLICK HERE.